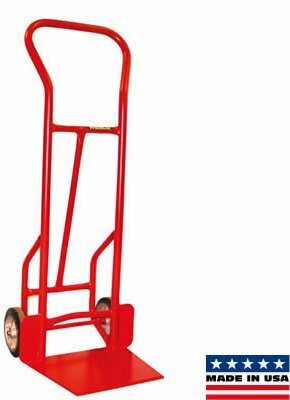 This industrial duty Shovel Nose Hand Truck has a 13” deep tapered “shovel” nose plate that slides easily under your loads and makes moving easier. It has a rounded continuous handle that assures you’ll have a safer and much more comfortable grip when you are moving your heavy loads, and wheel guards to provide protection. 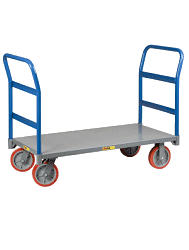 No assembly is required with this hand truck that will carry 900 lbs worth of cargo. Its heavy duty 1” steel pipe frame has a 5-year guarantee against weld failure. Its powder finish will not rust. 53" O.A.H. / 20.5" O.A.W. Nose Plate: 13" deep x 17.5"